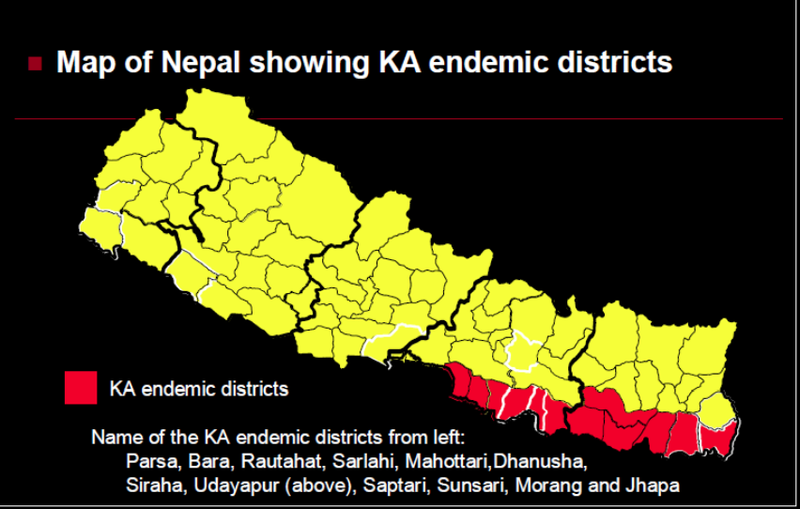 Although Visceral Leishmaniasis (Kalazar) has been on the decline in Nepal, this year, along with the coming of the monsoon, there has been a spike in the number of cases of Kalazar, according to a post on the Ekantipur website. Masses of sandfly, which is the vector of this disease, have been noticed in the aftermath of the onset of the monsoons at the foothills of the Himalayas. Cases of Post Kalazar Dermal Leishmaniasis (PKDL) are the known reservoirs of this pathogen. Annually, an estimated 3000 people suffer from one form of this disease or another, while a reported 708 people suffered from visceral leishmaniasis in Nepal in 2010. In addition to anti-vector measures, there is a massive lack of awareness that needs to be ameliorated, especially in vulnerable populations, like those living in squatter settlements or in the poor neighborhoods, where the likelihood of getting exposed to sandfly bites is greater. In order to win in this struggle with the disease, it is of extreme importance to note that there has to be community participation to ensure protection from the vector in addition to public health policies that look to combat the issue in a transdisciplinary and holistic fashion. Tags: kalazar, leishmaniasis, post kalazar dermal leishmaniasis, sandfly, vector borne diseases, vectors. Bookmark the permalink.